There are multiple examples of Microsoft Word 5.1 nostalgia on the web. For various reasons, many Mac users have come to believe that Microsoft Word 5.1 was the last great word processor for the Mac, that it was a near-perfect product and that it’s been all downhill from there. 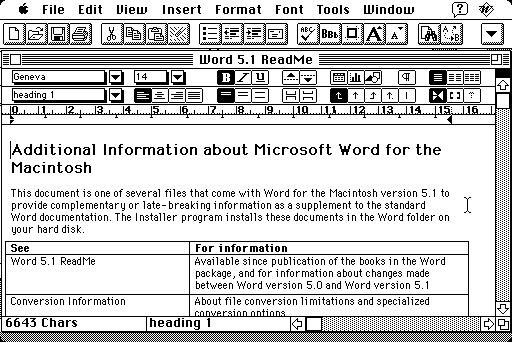 Microsoft Word 5.1 came out in October of 1991. It was the culmination of six years of Mac Word versions (version 1 and 3; there was no Word 2 for Mac because it skipped version numbers to match up with the DOS version), a minimalist interface with just enough window chrome to let you align text, pick a font, space your lines—do the simple things you need to do when composing a document. No multimedia here, no fine-grained control over typeface features (if only because there weren’t any fine-grained typeface features), no nothing that didn’t need to be there. To me, these are all essential features in a modern word processor, not “fine-grained” stuff for fussy perfectionists. Word 5.1 provided only rudimentary access to them. How does this make it the perfect word processor? The author then goes on to argue that John Gruber’s Markdown is the new Word 5.1. I love John Gruber’s writing and I read his blog every day. But I don’t use Markdown and I don’t see what the big deal is. Why? Because it only provides a bare-bones syntax for basic manual formatting options. Here again, there are no options for the web equivalents of user-defined paragraph and character styles, which are block-level and span-level CSS styles. Correct me if I am wrong, but isn’t one of the main attractions of web-based publishing the ability to apply markup to one’s text in a smart way? As far as I can tell, Markdown encourages you to treat all occurrences of italics formatting as emphasis, and all occurrences of bold formatting as strong emphasis. But italics and bold formatting can be used for many other purposes. With CSS styles, you can define different character(span)-level styles that all looks the same (italics, or bold) but actually mark your words with references to different style names, associated with different meanings. You cannot do that with Markdown. The way I see it, Markdown dumbs down web publishing by erasing the differences between the various meanings of italics or bold formatting, and by not providing easy access to other, user-defined character styles. And it also fails to encourage web publishers to use paragraph(block)-level styles other than the basic ones (headings, blockquotes, etc.). So basically, while modern standards give us tools to apply markup to our documents in a smart way, a solution such as Markdown restricts the use of markup to a very limited set of elements. Sure, they might be the most common ones, but they also assume that writers do not want to bother to apply smarter, more fine-grained markup to their documents. They assume that writers still use their computers mostly as glorified typewriters. And that’s just some of them. In Pages ’09, I have a different character style for each of the above. Visually, they all look the same: they are all rendered in italics. But behind the scenes, I want my markup to distinguish between these various meanings of the italics formatting, because I want to be able to use spell-checking tools that will check French words against the French dictionary and English words against the English dictionary (and ignore other foreign words) and because I might want to have the option of being able to change, for example, the formatting of document titles to something other than italics further down the road, without changing other occurrences of italics formatting at the same time! And of course I also want to have easy access to other user-defined character styles that I might use for specific purposes. In this blog, for example, I have different span-level CSS styles for references to UI controls, computer code, file names, etc. I couldn’t edit my blog posts using Markdown, because it wouldn’t let me easy apply all these in a user-friendly way. Markdown does not help me do anything beyond basic manual formatting and is therefore useless to me (as are most other web publishing tools). And I find it paradoxical that someone like John Gruber, who seems to be such an ardent promoter of web standards, offers a tool that effectively dumbs down web publishing. In that sense, yes, I suppose that one could say that Markdown is the new Word 5.1. Just like Word 5.1’s UI put the emphasis on manual formatting at the expense of style-based formatting, Markdown puts the emphasis on dumb HTML tags at the expense of custom CSS-style-based formatting. But it does not mean that this is all that writers need. This is all that writers who do not want to bother to apply smart markup to their texts need. I have always been strongly attached to the use of smart markup, be it in word processing or in web publishing. I have yet to see a word processor that actually encourages its users to use smart style-based formatting. Pages ’09’s UI for styles is better than Word’s, but it still suffers from some severe limitations, such as the absence of support for hierarchical styles (styles based on other styles) and the absence of built-in support for keyboard shortcuts for styles (other than the very limited F1-F8 option). I am not saying that designing a good user interface for smart, fine-grained markup is easy. But Word 5.1 certainly wasn’t the holy grail in that respect. The other thing that Word 5.1 nostalgics seem to have forgotten is that document corruption already existed back then. I distinctly remember writing a whole chapter of my master’s degree thesis in Word 4 and finding myself one afternoon completely unable to open my Word document. I was faced with the prospect of having lost two weeks of hard work. I was eventually rescued by my local Mac shop, where some kindly technician took pity on me, took my diskette with my damaged document, disappeared in the back of the store for a few minutes and came back with a repaired copy of my Word document, which he was obviously able to produce with repair tools that I didn’t have access to. Without him, I would have lost two weeks’ worth of hard work — and all because Microsoft’s software was already crap back then and was already able to create document corruption beyond the user’s control. And that was even before Word 5. I highly doubt that Word 5 was, somewhat miraculously, a corruption-free interlude between other versions of Word. It is truly embarrassing that Microsoft is unable to make a word processor that performs acceptably on a powerful machine such as my 2009 Mac Pro. And, while Pages ’09 is generally faster, it also suffers from performance issues sometimes, with documents containing tables in particular. But for anything other than the performance, I am not particularly nostalgic for the days of Word 5.1. I was already hoping, back then, for a better, smarter word processor that would actually make it easy to compose smart documents — and I am still hoping for such a word processor today, twenty years later. I gave up on Microsoft a long time ago, and I have been much happier since I switched to Pages ’09 as my main word processor. But I have yet to find a truly great word processor for my Mac, and I certainly don’t see how anyone can claim that something like Markdown is a great tool, even in the more limited field of web-based publishing. This entry was posted by Pierre Igot on Tuesday, May 24th, 2011 at 10:05 am	and is filed under Microsoft, Technology, Writing. You can follow any responses to this entry through the RSS 2.0 feed. Responses are currently closed, but you can trackback from your own site.